?There are times when you don’t want to have to wear your shoes with the custom orthotics all the time. When you get home after work, kicking off your shoes to relax is one of the nice parts – but not if you have plantar fasciitis. Unfortunately, it is important if you suffer from PF, heel pain or foot problems to NOT walk around without any shoes on whenever possible. This is because your foot and ankle will not be supported properly or your pronation will be wrong, which will, in turn, cause foot pain to come back again. So what is the solution for guys who want to be able to relax at home but not have to use foot pain relief products like splints or support socks? You need a good pair of slippers with arch support built in. Slippers are excellent, especially in cold weather, but it is important that you buy the pair that has arch support as it will help reduce any additional stress and strain on the plantar fascia ligament. These kinds of shoes are not hard to find, but you might struggle to get any in your local store. If they sell slippers at all, they will be flat inside and although they might be very comfortable, they will not give you that arch support that you need. Made by a reputable company that specialises in making shoes and footwear for people with painful feet, these Asheville slippers get some glowing reviews on Amazon and look really good. They are made from leather, which means they are sturdy and are ideal for wearing around the house or even in the garden. They have been designed to fit properly too and have an adjustable strap to help get the right fit. Orthofeet have also designed the Asheville men’s slippers to have a soft-step sole, which will stop any jarring or vibrations from walking hurting your feet and ankles. One downside is that the arch support is not built-in to the slipper and is provided through an orthotic-style innersole. However, it does look like it is designed to fit into the slipper properly and it also means it can be replaced when it starts to wear down. Also, there are no comments that are mentioning the insole becoming loose or being in the wrong place, so this looks to not be a major issue. These men’s slippers with arch support also have some adjustable “spacers” which you can add or remove to help get the perfect support for your foot inside. This, combined with the adjustable strap will help you get the support you need. Due to the strap and spacers, these might also be ideal for people looking for slippers with arch support for narrow feet. If you can adjust the slipper to fit better, this will be a good option to choose. One problem that many people are mentioning in the comments for these arch support slippers on Amazon is that the sizing can be a problem when ordering. It seems that the best size to choose is one full size or half-size smaller than you currently are. This will help keep the slipper tight and supportive as some people are complaining that they are oversized compared to proper measurements. One buyer also had issues with the height of the heels inside the slipper, which made them feel as if their feet were pointing downwards and that they might tip forwards. However, I think this is just related to them not being used to shoes with such good foot support. I remember having the same feeling when I first started using shoes with better arch support and my orthotics. Despite this problem, the review was very complimentary of the slippers design and comfort. 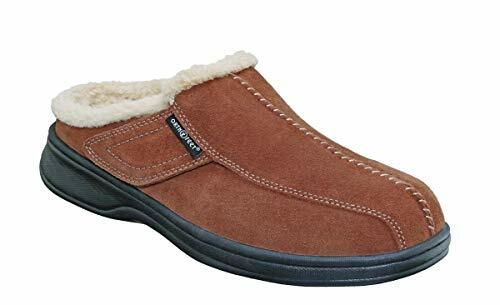 Overall this brand of men’s slipper with arch support looks to be ideal if you are looking for an indoor or house-shoe that gives proper support for your feet. With over 300 customer reviews (and 220 of them rating the slipper with 5 stars) the Orthofeet Asheville Mens Slippers look to be an excellent choice if you are looking for some extra arch support at home. Unlike buying shoes for plantar fasciitis, there are not really any specifics you need to look for in a slipper. Look for a pair that has built-in arch support as part of the footbed of the slipper. If the support is just given using a slip-in orthotic style insole, it will not be ideal. The reason for this is because slippers are not designed to be tight-fitting and after a while, the insole will move into the wrong position as the slipper “give” and your foot will not be supported properly. If possible, get a pair of slippers with arch support that has some sort of cushioning or shock-absorbing sole to them. This will help reduce any extra stress to the middle area of your foot. As with plantar fasciitis shoes, having a stronger area of support in the middle of the slipper will be important for them to be effective. Look for brands you recognise. As I write this, I am wearing a pair of slippers that my wife purchased from a local store that has no real brand on them at all. They are also as flat and as uncomfortable as you can get and do not give me much support for my PF problems. There are many brands of shoe manufacturer that specialise in helping people with painful feet, and they also make their own slippers too. Brand such as Vionic or Orthofeet are good ones to look for if possible as these have been designed and created with the help of podiatrists. As we will be looking for these products online, you can also consider the reviews given by other people who have already purchased the slippers. I always check the reviews before I buy and never opt for the cheaper products as these usually have lower rated reviews and have more problems and bad experiences associated with them. 5. What material are they made from? Also, consider the material that the slippers will be made from. The arch support should be built-in to the base of the sole, but there is also the material to consider. If you live in a hotter environment (which I think is probably the best place to live if you have foot pain problems – the hotter weather always seems to help me, despite me walking more!) then you might not want any sheepskin slippers. Also, if you use them outside, you will not want a pair that has any fabrics that are going to get damaged if they get wet at all. Note: I have to mention here the use of memory foam in slippers to help with foot problems. To me, I need a solid cushion to support the arch rather than something that might give and allow my foot to pronate to the wrong position. Also, if you are using memory foam slippers and have problems with the way you are standing or walking (gait) then this will be transferred to the support in your slippers – so I don’t really see the point.